Anna and Amaia's blog: No more juggling please! 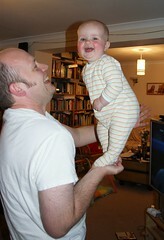 When I was wee (6 months ago) Daddy used to make me stand on his hand and it was great fun. I would stand there balancing for minutes on end laughing. Then something happened... I discovered fear. Now whenever Daddy tries to juggle me, I collapse my legs, cling onto him and look accusingly into his eyes in the hope it puts him off. It is just tooooo scary!